Shire Camelot Log Cabin is available in 3 Sizes 7x7 - 8x8 - 9x9 all of which have a ridge height of below 2.5m. The Shire Camelot is a simple log cabin yet featuring 19mm wall logs so is very much better quality than a standard garden shed. 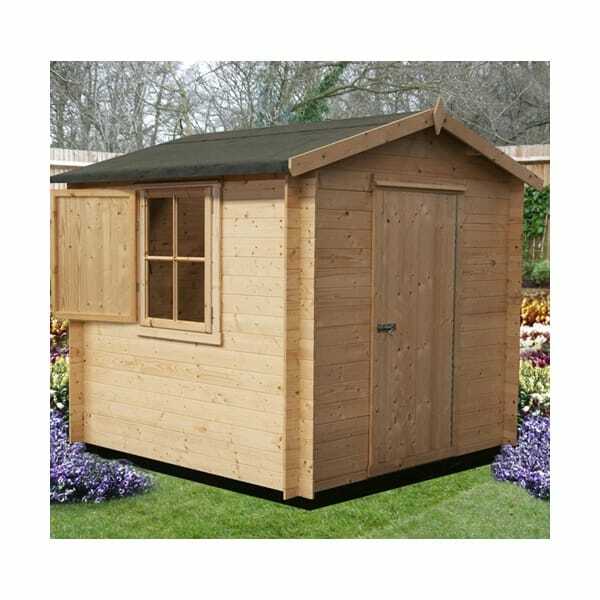 Featuring interlocking wall construction with matching 12mm Tongue and Grooved Roof and Floor boards this is a simple garden log cabin that can be put to many uses. The window shutter is included and provides extra security and insulation. great value Camelot Log Cabin form Garden Chic! in common with most Log Cabins this Log Cabin is Delivered untreated and will require the application of a Good Quality Timber Preservative as soon as Possible.